Carrier testing of adults provides information about the risk of passing a genetic mutation to your children, leading to reproductive (and some say, eugenic) decisions. Excessive carrier screening may have adverse effects, but it can also prevent suffering and open up new reproductive options. 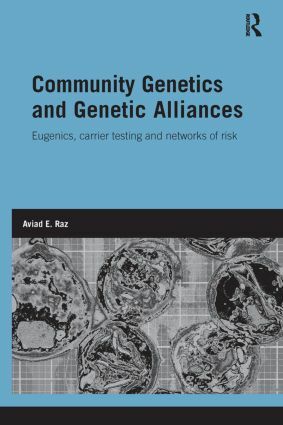 Raz's study focuses on the interplay of community genetics (the medical organisation of carrier screening) and genetic alliances (networks of individuals at risk), exploring how 'genetic communities' are emerging both within existing ethnic groups and around patients' organizations. While the interplay between carrier testing, reproduction and eugenics has sparked many discussions, this study provides a novel and much-needed perspective on its actual implementation and interpretation by community members. Conflating a cross-cultural spectrum of genetic communities, the benefits and perils of supporting (or restricting) carrier screening are located within broader social issues such as religion, ethnicity, multi-culturalism, abortion, stigmatization, suffering and care-giving. While carrier screening emerges as ultimately a morally justified pronatalist endeavour for the reduction of suffering, thus being different in principle from the 'old' eugenics, it can also carry unintended adverse consequences if left unattended to consumers, communities, or health professionals.